West Ridge trail, Redwood Regional Park, close to Skygate. I have been an East-Bay resident for almost 20 years, living both in Oakland and in Berkeley. When I first moved to the East Bay i lived on the outskirts of the Glenview area and that is when a new local friend took me up to Redwood Regional Park. We walked on the West Ridge trail and something stirred deep inside me. That walk under the huge pine trees felt like visiting a cathedral. The majestic Monterey Pine trees instilled a sense of the vastness and magic of the universe in me, and at the same time gave me a sense of sanctuary. I fell in love with the trail and have been going back ever since. But, over the last years it has changed. It is not a fairytale forest anymore. Now, it is a wide path with some loosely spread very tall trees. What happened? 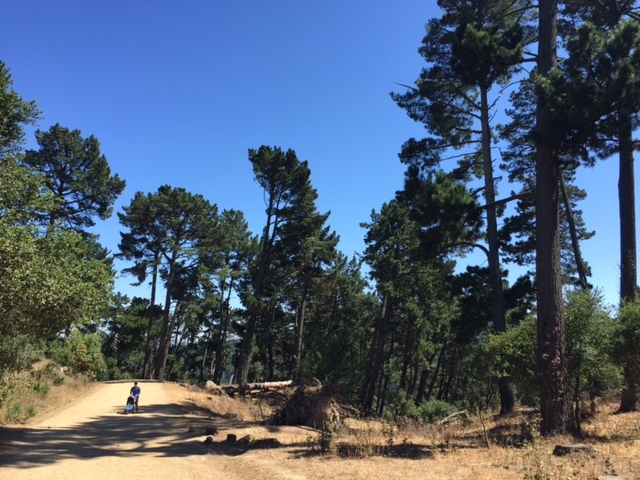 I recently learned about a federally funded plan underwritten by UC Berkeley, the City of Oakland, and the East Bay Regional Park District, according to which over 400,000 trees are going to be cut in the East Bay hills. The cutting is happening in stages and already started some years ago. That is why there is no pine forrest anymore along stretches of the West Ridge trail of Redwood Regional Park. The ultimate goal that some are pushing for is total eradication of Monterey Pine trees, Monterey Cypress, Eucalyptus, and Acacia in the hills. Why? The plan claims to promote fire safety. 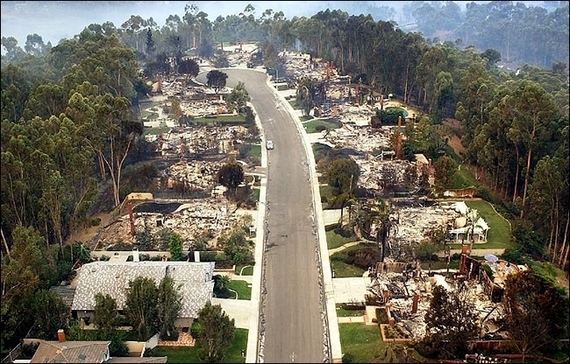 The need for a plan to decrease fire hazard goes back to after the big fire in the Oakland hills in 1991. Understandably, measures were sought to minimize fire hazard. But then things became muddled and went off target. The plan transformed into a campaign against so-called non-native species, targeting the four tree species mentioned: Monterey Pine trees, Monterey Cypress, Eucalyptus, and Acacia in the name of nature conservation and fire safety. Let’s look at both motivations. Moreover, cutting the trees, especially the really tall trees that create a wide range of shade, will make the hills drastically hotter (an estimated 20 degrees F) and drier. It will leave nothing but grasses that are dried out for most of the year. These catch fire much more easily and also allow it to travel at higher speed. Cutting the trees will increase the fire danger. There are historical studies that document that fires used to haunt the barren Oakland hills yearly. (HISTORICAL VEGETATION CHANGE IN OAKLAND AND ITS IMPLICATIONS FOR URBAN FOREST MANAGEMENT by David J. Nowak (9/1993). Back in the early years of the 1900s people like Joaquin Miller and Robert Sibley started large-scale tree plantings “primarily as a measure against the recurring fires that almost every year swept over the hills.” The tree eradication plan would undo this and greatly increase the risk of fires. Nothing to be gained here, but everything to be lost. The plan also claims to be a conservation project aiming to bring the hills back to where they were 120 years ago. Why 120 years ago? Was that their original state? Hardly. Nature is alive, constantly changing and evolving. It is the product of innumerable factors playing together and so creating conditions favorable or unfavorable for certain species to thrive. What was natural 120 years ago is not necessarily natural today. 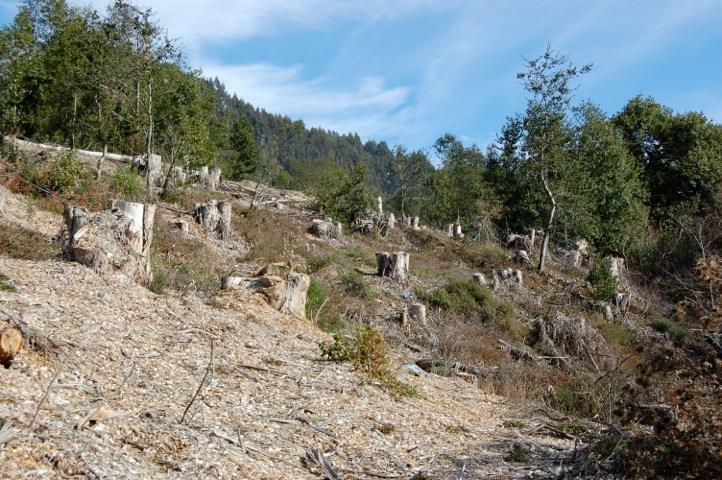 To forcefully cut down trees and to use toxic herbicides to prevent them from regrowing is not conservation, it is destruction of a functioning eco system. Some of these trees are over 100 years old—they have been here longer than many of us Bay Area residents. To call them non-natives is ridiculous. In fact, if we truly wanted to heed to this kind of conservationism most of us would need to go, including our houses, our cars, our cities, and our industries. The result of the massive tree cutting will be long-term devastation of now beautiful park land, the deaths of innumerable animals, health risks for the animals that do manage to survive and for all who use the hills for recreation. Nothing about this has to do with nature conservation. In the front of the photo: this is how the planned future for the East Bay hills looks. Every tree is a micro eco system and is habitat for birds, squirrels and insects (for example, the Monarch butterfly seeks out eucalyptus for its winter home). Groves and forests create a wider eco system with other animals who live on the ground around tall trees. If we cut down over 400,000 trees we destroy not only the trees but also the habitat of these animals, and without a place to go and food to find, we seal the fate of these animals, potentially millions of them. The toxicity of the herbicides to be sprayed twice yearly after the deforestation will kill or severely harm creatures on the ground, and destroy the food chain for the survivors. Eventually, the herbicides will make their way into ground water, and will permeate our environment. Furthermore, cutting down 400,000 trees destroys the biggest source of local carbon capture we have. Even if we were to act purely selfishly and were not to care for animals or trees, to take away that which helps clean our air and helps reduce carbon load is foolish. To sacrifice our green lungs (the trees) and most likely kill or displace millions of animals for the sake of restoring the hills to where they were 120 years ago is extremely ill-conceived. I do not believe that we have to stand by and watch this plan be put into action further. It has to be stopped. Fortunately, i am not the only one. Some organizations are already working on this. The hills conservation network has filed a lawsuit against the plan. They will have a booth at the Solano Stroll on September 13. Here are links to more information and a petition for you to sign. Thank you for helping me save the trees!